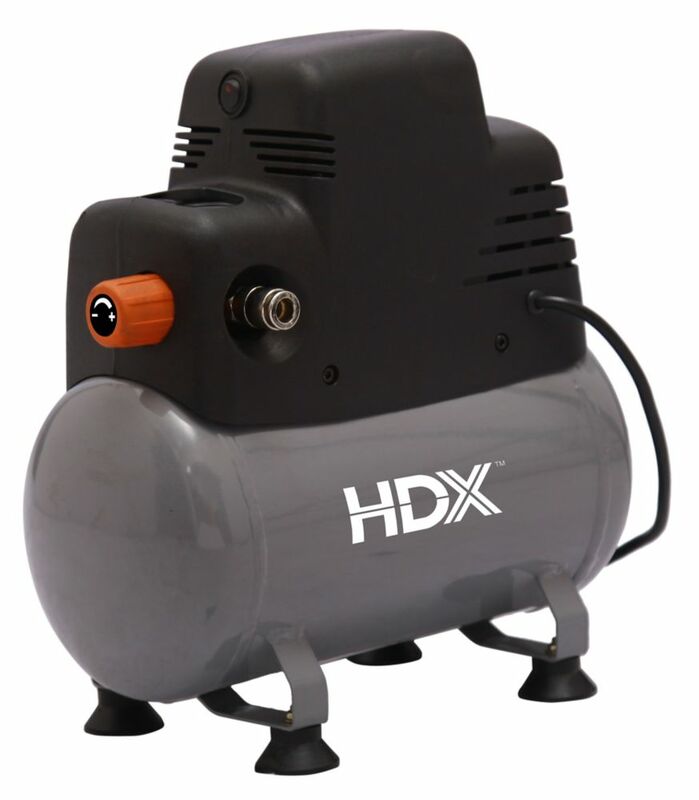 HDX 2 gallon portable electric oil-free air compressor is ideal for a host of inflating and hobby nailing tasks. This air compressor is lightweight, compact, and portable; the compressor delivers 0.4 SCFM at 90 psi and 100 psi maximum pressure. It features a low-maintencance oil-free pump that has no belts or brushes to replace and no oil to change. Includes a 25 foot coil air hose, 1/4 inch female quick connect plug, tire chuck, adapter, (2)inflation nozzles, inflation needle, and sealant tape. Oil-free pump provides low maintenance operation, so there are no oily messes to clean up after use. The lightweight, portable, compact design makes this compressor ideal for inflation and trim nailing tasks. Includes a starter 25 foot coil air hose and accessory kit. 1 year limited warranty. Call 1-800-514-6729 for details. The Hulk silent air compressors are designed to provide all power with little noise! The oil free, dual piston 2 cylinder pump with low amp draw and solid copper winding's allows for less wear and tear. These commercial grade pumps are designed with heavy gauge steel cylinders, cylinder head and valves for maximum durability and reliability. Providing 3.92 CFM @ 40 PSI and 2.69 @ 90 PSI and an amazing 33 DB @ 10 ft., 41 DB @ 3 ft. away! 2 Gallon Portable Oil-Free Air Compressor with 8 Piece Accessory Kit HDX 2 gallon portable electric oil-free air compressor is ideal for a host of inflating and hobby nailing tasks. This air compressor is lightweight, compact, and portable; the compressor delivers 0.4 SCFM at 90 psi and 100 psi maximum pressure. It features a low-maintencance oil-free pump that has no belts or brushes to replace and no oil to change. Includes a 25 foot coil air hose, 1/4 inch female quick connect plug, tire chuck, adapter, (2)inflation nozzles, inflation needle, and sealant tape.